The winners of The Daily Sentinel’s annual Christmas Coloring Contest received their prizes on Friday. Pictured are (front, from left) first place, Isabella Rose Baughman of Rutland; second place, Averi Hill of Ravenswood, W.Va.; third place, Layla Nibert of Syracuse. 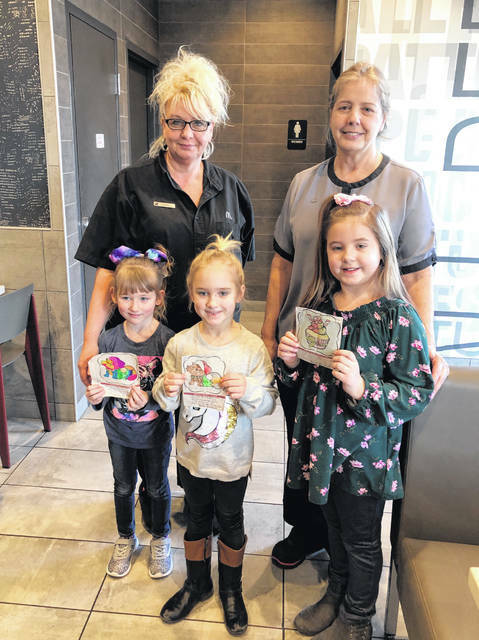 Also pictured are McDonald’s employees Kim Bias and Connie Roush. The coloring page is sponsored by Home National Bank, with the prizes sponsored by McDonald’s of Pomeroy.